Remember when Dayvee told you about this event and sounded off on it a little bit back in November, well it's now. "The Logo" aka "Mr. Clutch" now has the country covered from his college roots to his pro roots with bronze statues. 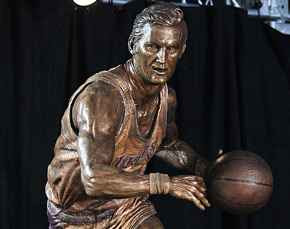 The Lakers unveiled their statue for Jerry West in a ceremony in LA leading up to All Star Weekend. 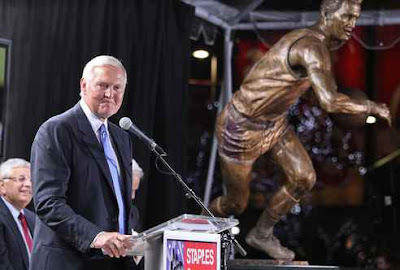 The statue joins those of former Lakers guard Magic Johnson, former Lakers broadcaster Chick Hearn, hockey and one-time Los Angeles Kings great Wayne Gretzky and boxer Oscar De Le Hoya in the Star Plaza at Staples Center. Well deserved Jerry and Congrats. "This is kind of awkward for me," West said after the likes of Commissioner Stern, former Celtics great Bill Russell, Lakers owner Dr. Jerry Buss, former Lakers Shaquille O'Neal and Magic Johnson and former Lakers coach Pat Riley spoke before him. "And to be honored by the people I admire most is very meaningful."